I didn’t even know where Cowichan was until last Spring when I was visiting Victoria! We loved visiting the island so much that when the opportunity presented itself to partner with Tourism Cowichan we were SO excited to explore more of the places Vancouver Island offers. What I love most about visiting the island is that it’s simply a ferry ride away (No expensive flights)! An Indigenous word that means The Warm Land. Cowichan is located in Canada’s only maritime Mediterranean climatic zone and is home to the warmest year–round temperatures in the country. In fact, when we arrived in Cowichan my husband and I both mentioned how much warmer it felt in comparison to home. The day we left home it was pouring rain, and when we arrived in Cowichan it was warm and cloudy. That evening before dinner the sun broke through the clouds! It was beautiful! For decades now, Cowichan has been producing amazing artisanal food and drink from the region’s burgeoning farms, wineries, cideries and distilleries. 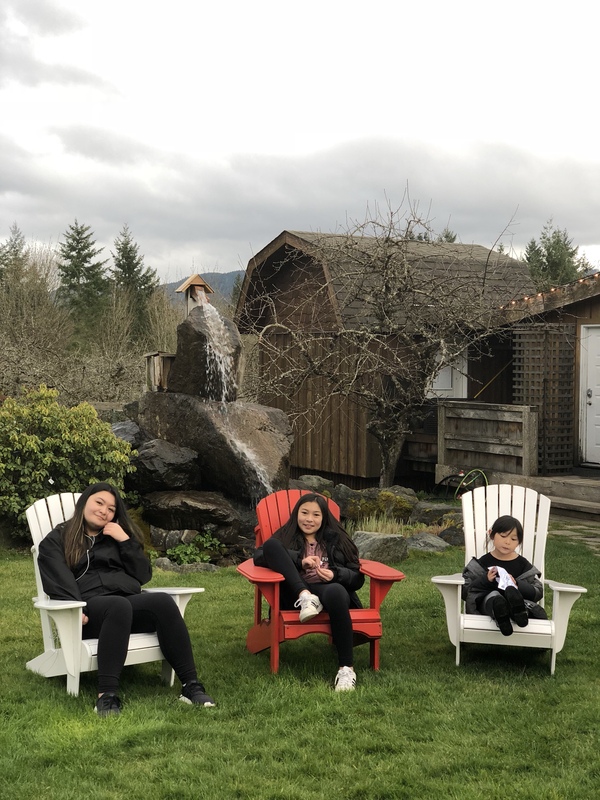 Before I begin to tell you more about the places we ate and played (that will be a separate blog post) on our Spring Break family adventure in Cowichan, I’m going to share with you where we stayed. I shared a lot of Instagram stories from the beginning of our trip until the end. I received many messages from my friends, and followers, thanking me for sharing because they really had no idea Cowichan had so many great places to eat, play & stay! Admittedly, neither did I. 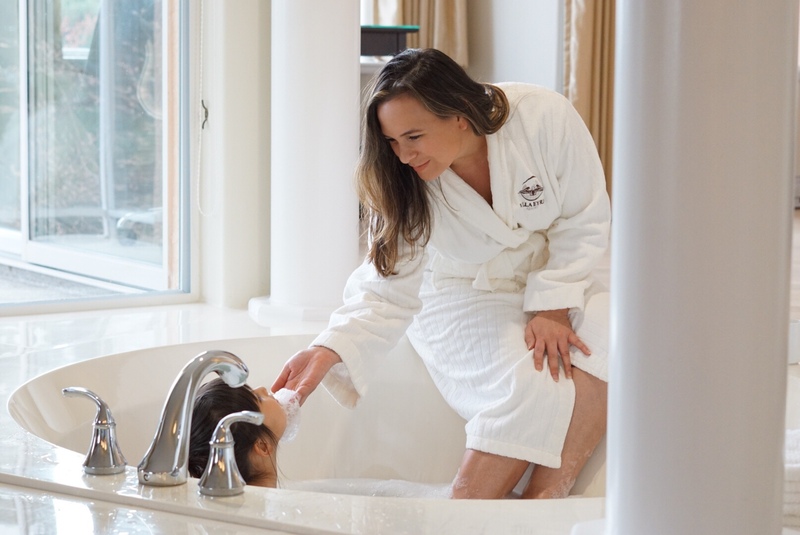 If you’re looking for a family-friendly getaway that won’t break the bank, I highly recommend staying in Cowichan. We had the pleasure of staying at three different places during our stay and each stay was uniquely different from the other. 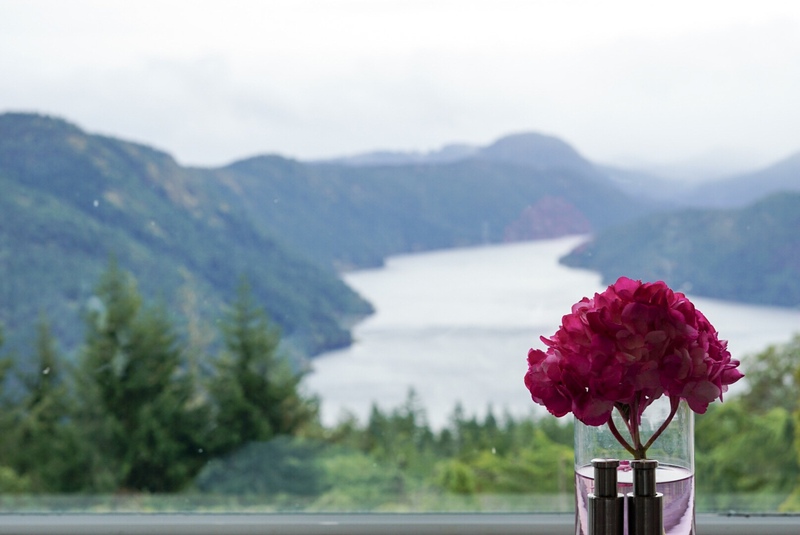 As we drove up to the Villa Eyrie Resort, which is situated 1,880 feet above sea level and sits on top of a hill overlooking the Malahat Summit, the kids gasped! In fact, so did I. They didn’t know what the resort was going to look like and when they saw how luxurious it is they squealed with delight. The gasps and squeals became that much louder once we checked into our suites. We couldn’t believe how massive the suites are! We had a master suite which is only one of the many types of rooms Villa Eyrie offers. 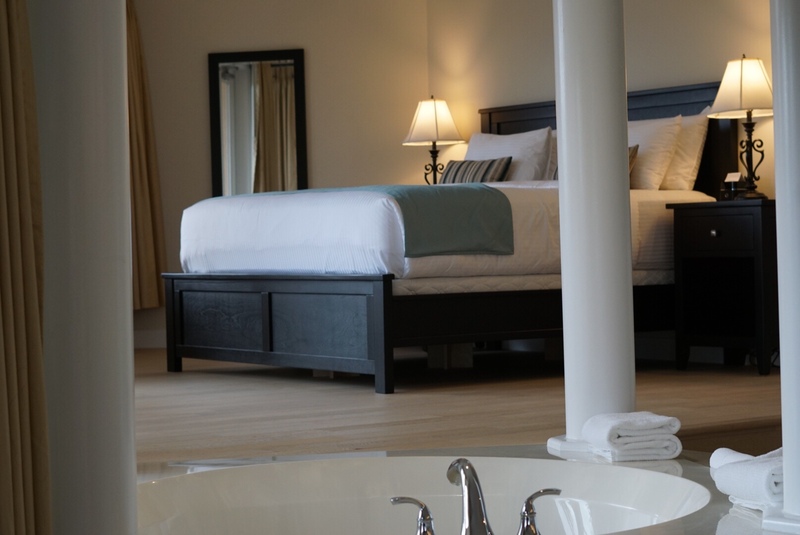 Aside from the master suites size, they also have giant soaker tubs in the middle of the rooms. The girls felt like there was a pool in the suite. Although the resort does have an indoor pool the girls couldn’t help it and as you can see from the photo below, Charley could not wait to have a bubble bath in the giant soaker tub. Private wrap-around balconies from our suites (The girls had a separate one across the hall from us with two double beds. The benefits of having a teenager lol). Large bathrooms with the best smelling products! Check out some of the other amenities and services Villa Eyrie offers here. 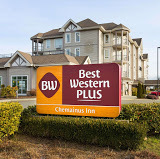 Located in Chemainus, BC, a quaint and eclectic Vancouver Island town, the Best Western Plus Chemainus Inn is just one hour north of Victoria, 35 minutes south of Nanaimo, 15 minutes from Duncan-North Cowichan and only 10 minutes from Ladysmith. We are BIG fans of staying at Best Western Plus! In fact, on our road trip in the summer we spent a few nights at one in Revelstoke B.C. This is the first time, however, we stayed in a suite with two bedrooms, a living room with a pullout, and a kitchen. It wasn’t as large and luxurious as the suites we stayed in at Villa Eyire, but the suite was perfect and cozy for the five of us. The hotel offers free hot breakfast, and coffee, tea /hot chocolate all day. The girls love that they can go and make themselves a hot chocolate whenever they please. 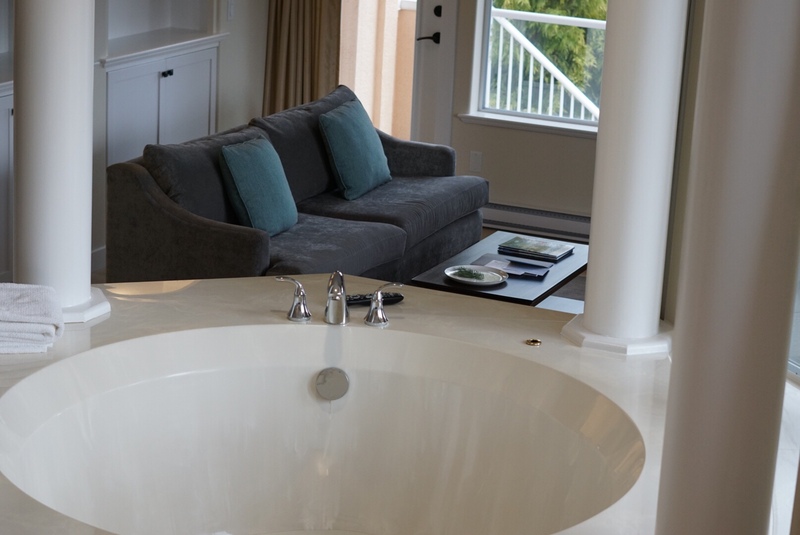 The Best Western Plus Chemainus also offers a business center area, gym, and a large saltwater pool with a hot tub. The hotel is located just steps away from the forty world-famous outdoor wall murals, the Chemainus Theatre, outdoor recreation and so much more. We loved exploring this town and I’ll be sharing some of the beautiful murals in a separate post. What do you get who you combine camping with a little “glam”? 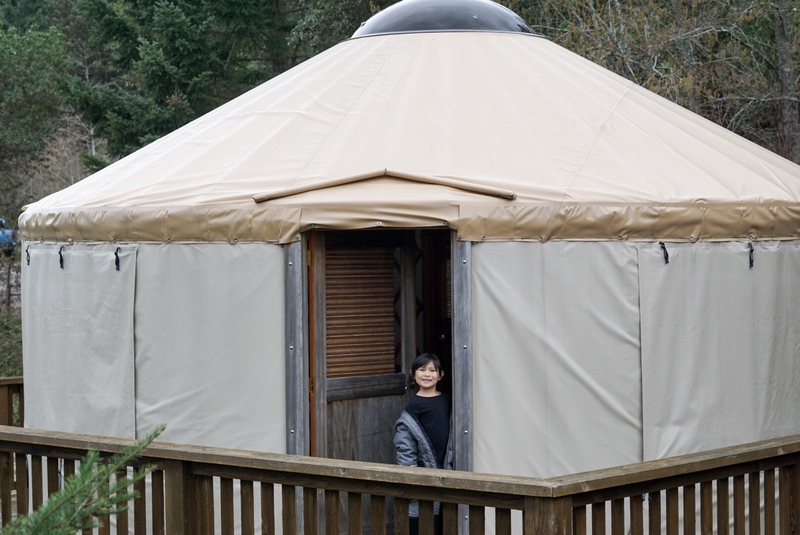 The answer is “glamping” and at Merridale they offer this increasingly popular pastime with two on-site “yurts” (circular, beautifully-appointed wooden-framed tents). Popular as bridal suites during our wedding season, each of the yurts sleeps two and feature hardwood floors, plush bedding and proximity to the lovely orchard. There are two yurts on the farm: the “Yarlington Yurt” and “Tremlett Yurt”, both named after varieties of apples in the orchard. 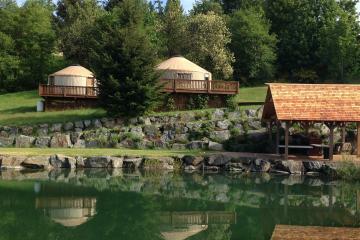 The family and I loved experiencing our very first glamping experience in a Yurt! 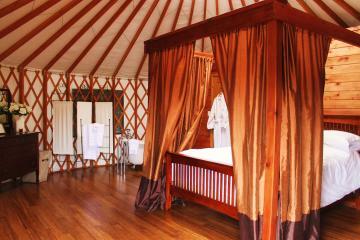 The Yurts have running water, electricity, cozy beds, robes, fireplaces, and more. 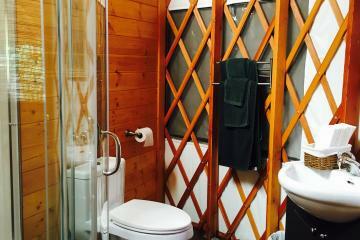 I loved the old-fashioned feel in our Yurt. In fact, I kept picturing Little House On The Prairie while I was in it. Is this how the pioneers felt back in the day? And if so, it wasn’t too shabby! Steps outside of the Yurts is the beautiful orchard. I loved feeling like we had the entire orchard to ourselves. In addition, nature sounds at night were so therapeutic. It was like a mini oasis away from the hustle and bustle. I can see why people love staying in Yurts. I would much rather stay in a Yurt over a tent. Glamping doesn`t get any better than this. Although my girls saw one insect and freaked it was still an experience we will never, ever forget. All in all, we enjoyed each unique place we stayed on our Spring Break visit to Cowichan, B.C. I love that we experienced a few different places to stay in Cowichan from a luxury resort to an inn that feels like a hotel in a town full of famous murals to “glamping” in a Yurt! Which stay do you think your family would enjoy the most? Be sure to watch out for my next post, Family Friendly places to visit in Cowichan. *Thank you to Tourism Cowichan for sponsoring our stay. I hope this post encourages you to get out there and #exploreCowichan too! Thanks for visiting Chemainus and I look forward to your post on the murals and more about my hometown. You’re so welcome! We loved visiting!